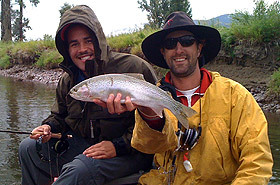 At the Blue Damsel Lodge it’s all about you – your fly fishing vacation and lodge adventure. Ultimately, it’s all about what you take home with you. Great fly fishing, food and friendship build great memories. Sharing a fishing trip with a friend and guide builds lifelong bonds. Learning more about our rich western history and improving in some area of our sport puts new dimensions in lives. Recreation re-creates. The key to a great lodge experience is the people, both staff and guests. You and probably only 9 others will be treated as guests and friends by everyone. The Blue Damsel Team is truly glad to have you visit. Your requests, comments and interests will be heard and details will be attended to; because they all care. Your experience begins with the drive to the lodge. Leaving Missoula you will pass through Hell’s Gate and parallel the Clark Fork of the Columbia River most of the way. Once you turn onto Rock Creek Road, slow down and enjoy the ride. The scenery is grand and the wildlife plentiful. You may see Big Horn Sheep, Whitetail Deer, Mule Deer, Merriam’s Turkey, Moose, Osprey and Eagles along the way. Take advantage of the many pull offs and savor the views of Rock Creek and the Sapphire Mountains. Upon arrival, you will be greeted at the front door of the Blue Damsel Lodge. After settling into your room, explore the lodge and its grounds. A well stocked bar is always open. Fix a drink and relax on the many porches and decks. Or, tune up your fly casting with a complimentary lesson. Appetizers are served at cocktail hour every day. At dinner, the chef will please you with beautiful presentations and gourmet cuisine. Breakfast and dinner schedules are coordinated with fishing. You will be awakened at the right time for breakfast. Dinner will be ready soon after you arrive back from your day on the water. Wine is served with dinner and matched to the night’s menu. Tasty lunches are usually prepared streamside by our guides, who are simply as good a guide staff as exists in the business. Rob and Jenny met at a fly shop, went fly fishing on their first date and were married on the fly casting dock at El Pescador Lodge in Belize. They are both Orvis Endorsed Fly Fishing Guides on the Lower Mountain Fork River in Southeast Oklahoma in the winter months. Rob has been a fly fishing guide for 26 years and is a 3 time finalist for Orvis Freshwater Guide of the Year. He has a degree in Entomology from Texas A&M University. He frequently serves as the replacement chef here at the lodge. He is a student of history, science and nature and is always happy to tell you more than you probably want to know about a subject. Jenny has been a fly fishing guide for 8 years. She is the 2018 Orvis Freshwater Guide of the Year. Jenny is a graduate of The University of North Texas. Among many other duties, she is the Social Media Manager for the lodge. She loves painting, photography and playing drums and guitar. Keith is the CEO of our parent company Orion Adventures LLC and Manager Emeritus of Blue Damsel Lodge. He has been a part of Blue Damsel Lodge since the very start. Along with 3 other members, he bought the property, converted it to a fly fishing lodge and was the Managing Partner for 15 years. He retired in 2015, but was coaxed back into action by his longtime friends Rob and Jenny to bring his hospitality and personality back to the Blue Damsel Lodge. He can frequently be found playing acoustic guitar near the fire pit in the evening. Tim has worked under Chefs Emeril Lagasse at Emeril’s NOLA in New Orleans and Tabb Singleton (2013 Food Network Chopped Champion) at The Moon Tower Bar & Grill, Abendigo’s, and Tabb Singleton’s Southern Kitchen near his hometown of Broken Bow, Oklahoma. In 2010 he took 1st prize in the Oswalt Culinary Cook-Off for Oklahoma Chefs. Your fishing days will be spent with these knowledgeable, professional, courteous Montana fly fishing guides-all licensed under the licensed Montana Outfitters that we work with and hand selected with you in mind. Before dinner, you can relax and enjoy a cocktail & appetizers and share the day’s adventures with your fellow guests. Or, do some self guided fishing in Rock Creek out back. Or play a game of horse shoes. Or take a walk into the National Forest. Or sit on the deck and spot Moose. After dinner, if you aren’t ready for bed, the staff will build a fire in one of the outdoor fire pits and you can sit up for a while.